On 7th March, the President of the European Milk Board (EMB), Erwin Schöpges, presented their rehashed “Market Responsibility Programme” proposal to members of the European Parliament. The Programme, suggested to be used to help prevent milk market imbalances in the EU dairy sector, calls for a combination on new EU instruments to monitor the market and then respond to indicators of possible market imbalances, including a proposal for an obligatory production reduction tool. 1. Early warning (Market Index falls by 7.5 %): Monitoring agency announces early warning; Private storage is opened and incentive programmes for extra consumption. 2. 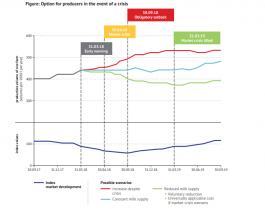 Crisis (Market Index falls by 15 %): The crisis is officially established by the Monitoring Agency; Voluntary production reduction measures are introduced with a levy placed on farms who increase their production. 3. Obligatory cutback phase (Market Index falls by 25 %): Obligatory production reduction measures would be introduced. With these proposals now being pushed for inclusion within the market management tools of the future CAP, ICOS reiterates our strong opposition to the introduction of any such mandatory supply management scheme or voluntary schemes which include a penalty on farmers not participating. Such schemes fail to address the reality that EU dairy operates in a global market. Obliging EU farmers to reduce production would force us to withdraw from world markets and only serves to benefit our competitors in New Zealand and the US, allowing them to gain market position. The future CAP must be forward-looking, not backward, and ensure policy certainty for farmers and the agri-food industry. This proposal would serve to undermine the planning and investments the industry had made in recent years and the hard work and personal investment made by dairy farmers.